One of the cuts of venison we got from my husband's kill was simply marked "steak" on the package. Now when I think steak, I think beef sirloin or filet mignon, so naturally I had assumed that this would be a similar cut. Once thawed, however, I discovered that it was more like bone-in flank steak, with tendons running down the length of the meat. As venison is already a tougher meat, it looked like the only way to enjoy the steak was to slice it thinly across the grain and marinate the heck out of it. So the next question was, how does one serve meat this way? 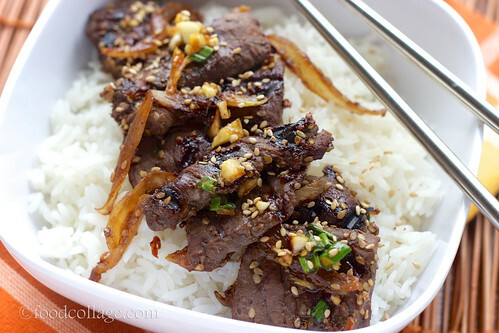 Well, like Korean bulgogi! 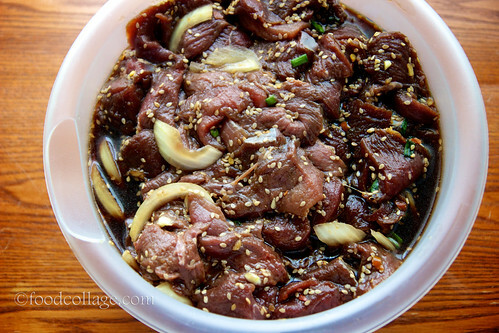 I found this great bulgogi sauce recipe online and used it to marinate my meat overnight. Once the meat is marinated, I cooked it on a preheated, oiled grill (pan frying in an oiled skillet under high heat works too) until slightly charred on both sides. I served it with rice, topped with more bulgogi sauce (I made a second serving for the topping).